I've always loved Pad Thai. My love adventure with this classic Thai dish began when I was younger and wasn't sure what else to order when we would go out for Thai food! 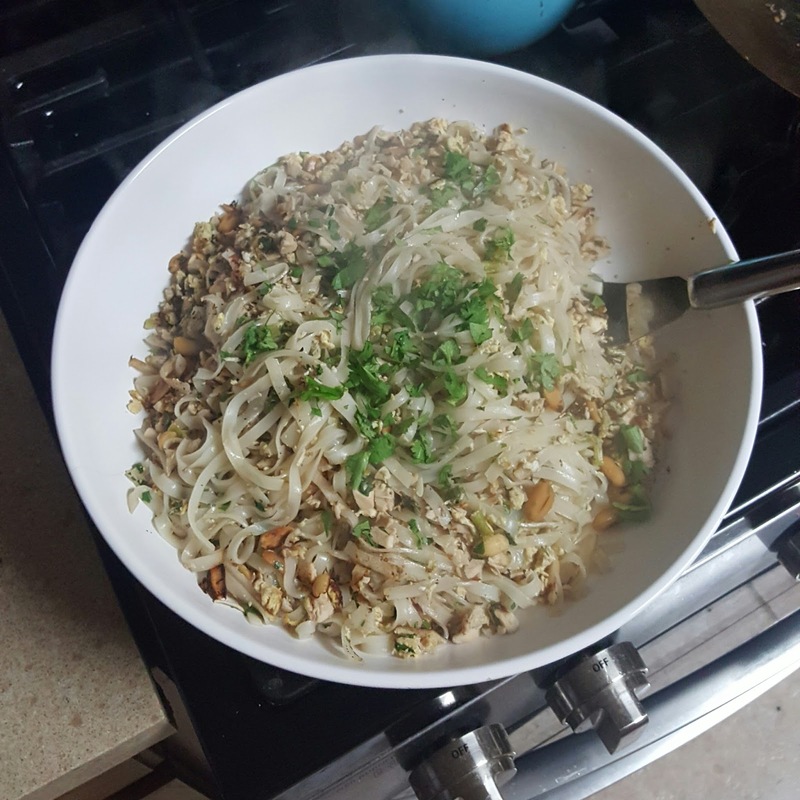 I've slowly gotten a bit more courageous, but I keep falling back to my first love of Pad Thai! The other night, we were on the phone and my wife's aunt mentioned how she always remembers how good it was when I made Pad Thai for the family a few years back. 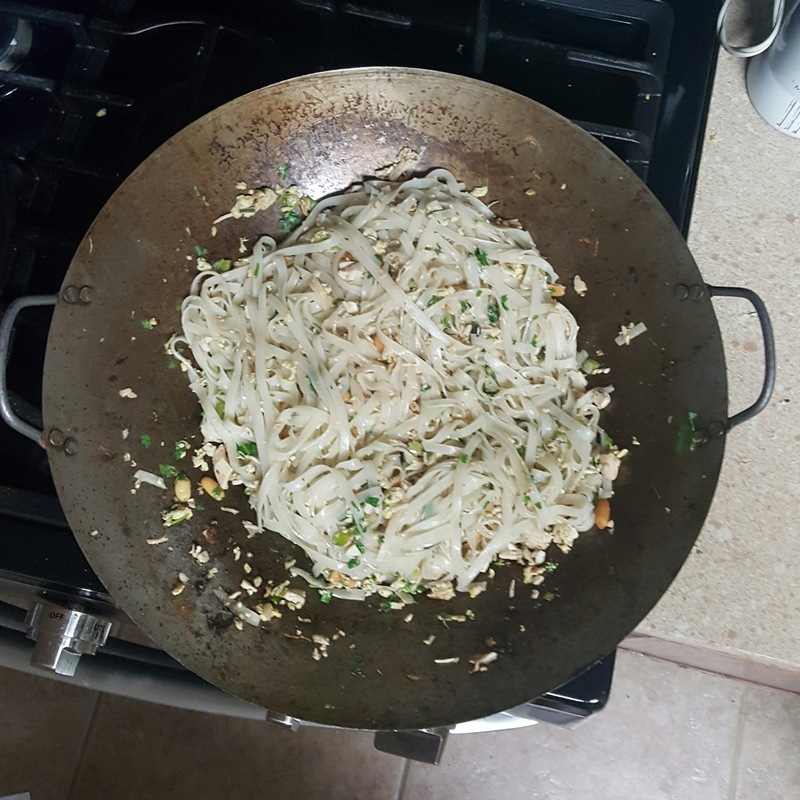 I dusted off my recipe, and my wok, and set out to make it for dinner! The key to making great food in a wok, is to get the wok good and hot. That said, the food is going to cook really fast, leaving very little time to prep in between steps. It is best to get everything chopped, prepped, and ready, before the cooking process starts. I've found that each brand and package of rice noodles has different instructions. It typically involves soaking the noodles in hot water. Be sure to follow the instructions on the package. I find it is best to get this going first. It usually takes around 30 minutes. Over medium-high to high heat, add the peanut oil to the wok. Throw in the green onions and garlic. Stir around quickly. Once the garlic starts to brown, add in the 4 eggs, all at the same time. I like to use a whisk here to scramble the eggs over the heat. It makes it easier to keep the eggs from staying in one piece too. Add in the rice vinegar and fish sauce. Combine the chicken and cayenne in a bowl. Stir to coat the chicken with the cayenne. Add the chicken to the wok. Stir occasionally until cooked. Add in the peanuts and rice noodles. To make sure everything gets combined and the noodles get heated evenly, the best thing to do here is toss everything like a salad! Add in the lime juice and cilantro as you stir it. I like to serve this with soy sauce, sriracha, and garlic chili paste. For a few different variations, this recipe also works great with shrimp, beef, and pork. Just make sure to adjust the cooking times accordingly. For tips on cleaning your wok after use, go here.